But the Regional Plan Association, working for a Brooklyn Heights group, stopped short of calling for the roadway to be fully torn down. The city should nix two lanes of traffic on the Brooklyn-Queens Expressway when it rebuilds the crumbling infrastructure in the next few years — a change that would reduce congestion and curb emissions emitted from the thousand of gas-guzzling trucks that travel it daily, according to a new report released Tuesday. The state should reinstate two-way tolls on vehicles heading both to Brooklyn and Staten Island across the Verrazzano Narrows Bridge. Equalizing the toll in both directions should divert some Staten-Island bound cars to other routes, and away from the BQE. Currently, drivers only pay as they enter the Rock. Make the city’s free East River crossings — the Williamsburg, Brooklyn, and Manhattan bridges — all High Occupancy Vehicle-only. The city had similarly proposed making the Williamsburg Bridge HOV-only before Gov. Cuomo abruptly cancelled the L train closure. Implementing HOV-only lanes on the free East River bridges would cut traffic by 20 to 25 percent, sending fewer cars to the BQE. Also make the entirety of the BQE HOV-only for cars. The restriction would similarly reduce traffic by 20 to 25 percent on the expressway. “Evidence is mounting that removal of highway lanes results in reduced traffic and seldom results in the kind of congestion that is frequently feared,” the report states. In September, the Department of Transportation proposed two equally expensive — and equally criticized — options for rehabilitating the Robert Moses-era triple cantilever that carries up to 153,000 vehicles per day: a temporary six-lane highway on the historic Brooklyn Heights Promenade until the old highway is completely rebuilt in place, or rebuilding the expressway lane by lane, potentially creating traffic jams for up to 12 miles. Since then, politicians and local civic groups have been coming up with their own alternatives to the city’s more than $4-billion proposal. A local group fighting the city’s two options, A Better Way, tapped the Regional Plan Association to come up with its own suggestions. The Association’s report follows Comptroller Scott Stringer’s proposal to turn the highway into a truck-only highway with a park on top, and Council Speaker Corey Johnson’s call to consider knocking it down entirely. The RPA report, however, stopped well short of calling for the roadway to be eliminated, though it did feature an entire page devoted to five cities that removed their busiest highways for the benefit of urban dwellers. “Cheonggyecheon Freeway [in Seoul] served 168,000 cars per day. It was torn down and is now a beautiful green space in the city and the city has increased transit significantly to accommodate traffic,” the report states. The Department of Transportation said it is still reviewing all options, including those outlined in the RPA’s report. “We are undertaking a thorough review process, accompanied by substantial community and expert engagement, that will look at a range of options for this critical transportation corridor,” said agency spokeswoman Alana Morales. So Brooklyn and Queens planners would rather that New Jersey, north Manhattan, and South Bronx residents have to put up with more heavy truck pollution then, as well as more congestion on the Cross Bronx Expressway and the Triborough, Whitestone, and Throgs Neck bridges, as well as drive the cost of shipping up some to Brooklyn and also to areas along the Long Island Expressway west of the Whitestone and the Van Wyk Expressway? In the case of the South Bronx that seems kind of discriminatory. I have a better solution. Why not put the northbound lanes above the southbound lanes and put both in surface tunnels, essentially big rectangular culverts, which would leave room for some longitudinal park space and bike lanes above the northbound lanes at the same elevation as the street above the expressway. If you do this any pollution in the tunnels can be blown-out to either end or even filtered and released in a smokestack. There is enough room to get 4 lanes in each direction plus a breakdown lane on each side, which would leave room for 60-72 feet in width above for park space and bike lanes. Surface tunnels would greatly reduce traffic noise and pollution. the tunnel idea only works if its limited to vehicles with commercial plates. The way to pay for the tunnel is remove the blight of the BQE and RESTORE THE PRE EXISTING Street grid. Selling off the land would generate enough to build a 2 lane tunnel to support commercial vehicles. 2 lanes is all one needs for the commerical vehicles that use the BQE. PLUS generate enough land to create about 100,000 housing units, schools, parks, shops, etc. etc. finally, removing the BQE blight would dramatically increase desireabllty of property for blocks all around. remove the BQE and restore the pre-existing street grid. 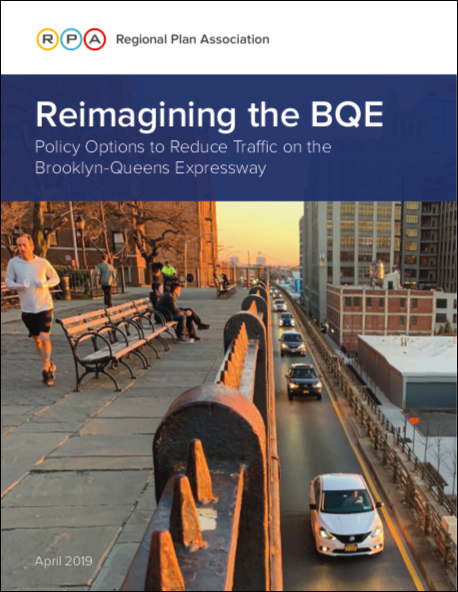 Equalizing the tolls is all that has to be done to cut the BQE to two lanes in each direction, because that’s what it is now. Eastbound it is squeezed down to two lanes coming off the Gowanus, which backs everything up because the majority of vehicles try to go there rather than pay the Huge Carey Tunnel toll. And westbound it is squeezed down to two lanes approaching the Brooklyn Bridge, so the bridge traffic can have its own lane merging onto the highway from Fulton Street. Again, because people are avoiding the toll. These are roads I use for travel out of town. And since I’m cheap, if the traffic allows, I do head for the Brooklyn Bridge. But if the tolls were equal, and the Manhattan side exit to the Huge Carey tunnel were improved, I would always use the tunnel. Multiply by 50,000-plus vehicles per day. If that 1.5 mile stretch of the BQE were made truck-only, and the extra lane on the State Island Expressway were extended to the new Goethals, then more trucks would choose to take the “Southern Gateway” for freight rather than the Northern. The generations born between 1930 and 1957 or so have left his country broke, and NYC is among the most broke places in it. So any solutions will have to involve less money, not more. Your suggestion that planners want to send truck traffic elsewhere is misleading. In the RPA report which this article discusses (http://library.rpa.org/pdf/RPA_Reimagining_the_BQE.pdf), only 7-9% of vehicles during the PM peak are trucks (see page 10, “Existing traffic and lane requirements”). A two-lane-each-way BQE could easily handle that amount of commercial traffic. Heck, maybe even a one-lane-each-way BQE could. The issue seems to me to be the non-commercial traffic (e.g. regular cars). If the number of private vehicles can be reduced through any of the five ways the report mentions, or by Comptroller Stringer’s proposal, then a lot of time and money can be saved. That is because during the PM peak most commercial drivers doing local delivery work are already finished with their workday. Most commercial drivers doing local delivery work start their workday by 6:00 AM and some even earlier. Of course there are a few shippers further out on Long Island that ship in the late afternoon but most truckers try to avoid the PM rush not just in NYC. Why do you want to discriminate against non-commercial traffic that needs to cross Brooklyn and Queens without spending a couple hours doing it? Why go so far out of the way just to avoid that little stretch of highway? Won’t doing that emit more greenhouse gases unnecessarily? That is why my stacked surface tunnel idea works so well. Yes it is more expensive but it can be hidden well, it will virtually eliminate noise, and pollution inside can be treated and become far less of a problem too. Besides, we are only 15 years away from a majority of the vehicles in the US being hybrid or EV which will also greatly cut exhaust emissions. Actually, if you study the issue, post-Korean War Baby Boomers didn’t have life nearly as easy as post-WWII Boomers. Boomers born from the late 1950s through 1963 had it only slightly better that Gen-Xers too. Do remember that there was a recession in 1953-54 and then a big recession from 1956-59 that was large-enough that it killed 5 US auto companies and mortally-wounded a 6th, which died in 1963. The biggest issues that killed central cities were trolley commuting, commuting by car that started in NYC in earnest with the Bronx River and Hutchinson River parkways in the 1920s, and then the major discovery made during World War II that single-story manufacturing supplied just-in-time by heavy truck was half the cost of older multi-story manufacturing on expensive land adjacent to freight railroads in cities. During World War II our government built hundreds of major outlying war plants and military bases outside cities and then built modern divided highways and even some freeways to connect suppliers and plant employees in cities to these outlying plants and bases. This one item murdered inner-city multistory rail-dependent manufacturing. After the war inner-city manufacturing firms with the money to do so couldn’t wait to move to the suburbs and build new single-story plants. Just-in-time delivery by heavy truck eliminated the need for most warehousing which further cut costs. Old rail-based manufacturers needed a couple months of parts in-stock while just-in-time delivery by heavy truck reduced that to a couple of days. All those huge old multistory factories on land that was once very expensive had paid huge amounts of tax to support cities before the mass exodus that took place immediately following WWII. Underfunded companies that couldn’t afford to build new outlying plants died in droves in the recessions of the 1950s. You can blame Euclidian zoning from the 1920s, the Housing Act of 1934 and its revisions, later VA mortgage funding, as well as a tremendous shortage of housing after World War II for the rapid growth of suburbs after the war. Robert Moses gets some of the blame too, as he built almost 200 miles of limited-access parkways outside NYC before World War II. Presidents Hoover and FDR get some of the blame too for building the US primary highway network in the 1920s and 1930s. What year did the middle-half of the Pennsylvania Turnpike open? 1940. The New Jersey Turnpike and part of the Ohio Turnpike opened in 1951. You can blame the 1939 Toll Roads and Free Roads study that led to building 2000 miles of toll freeways across the US before Ike signed the Interstate highway act too. My view is that the BQE is a national defense highway that belongs to all Americans and taking it out would cause unnecessary pollution including unnecessary greenhouse gas emissions on other longer routes. NYC median household income is almost $95K. According to Zillow the median home price in NYC is $683K. You want to see broke how about trying any city across the Southern Great Lakes region? The median household income in Detroit is under $29K and the median home price is under $40K. Detroit used to be the 5th-largest city in America before Republicans and neoliberal Democrats teamed-up to destroy it. In Dayton the median home price is $50K, in Flint it is $39K, and in Youngstown it is $37K. A majority of the homes for-sale today in Youngstown are in foreclosure. You obviously don’t know what broke is. Wait until you have to try to survive a decade of 25-40% unemployment while customer after customer after customer goes bankrupt. Until you survive that there is no sense even trying to pretend you know anything about being broke. Do not say “Hugh Carey Tunnel”. American Community Survey data shows that the median household income of New York City households was just 0.9% higher than the U.S. average in 2017, at $60,879 compared with $60,336. Are you quoting family income? Metropolitan area data? What? This source claims the figure is $93,900. Perhaps the process will result in a better plan — but it will definitely insulate the mayor from the political fallout of his DOT's initial plan.